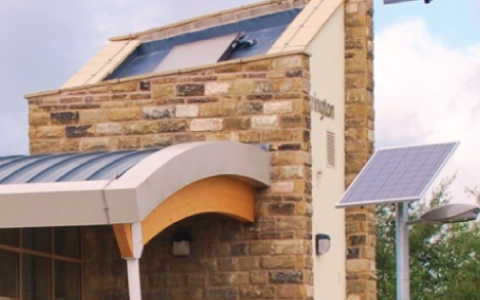 In May 2010 The Low Carbon Energy Company were successful in tendering for the photovoltaic installation works at the Accrington Eco Station project . Accrington Eco station is being built as part of the SusStations Project and will be the first Eco station on the Northern Rail network. The Sustainable Stations project is about encouraging a new generation of sustainable, low carbon railway stations. Local authorities, the rail industry and other interested groups are working together across North West Europe to demonstrate and encourage sustainable station schemes. Twelve 6 KWp Solar PV panels were mounted on top of lighting columns around the perimeter of the car park. The second phase of the project saw a further 18 solar panels installed on the station roof. In total the solar panel system provided over 5000 kilowatt hours of electricity and reduce carbon emissions by over 3 tonnes every year for the next 25 years. Part of the decision to award the contract was based on the fact that we are a local company and where possible use a local supply chain to procure goods. This was a key component in the delivery of the project which aimed to procure services that are sustainable and reduce energy consumption and CO2 emissions. The Low Carbon Energy Company were proud to be involved in this ground breaking and innovative project as an essential element of our company ethos has always been to address climate change and develop the local economy.